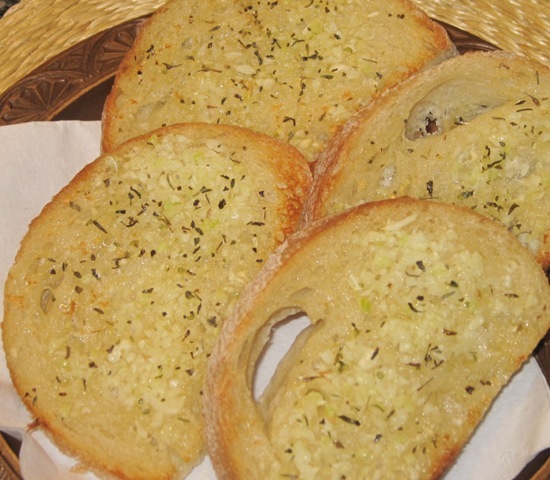 Today I am sharing this simple recipe for a very fresh tasting Garlic Bread. You can make it with butter, or even olive oil. Ukrainians love their bread, and eat it not only with salads, but also with soups, and even pasta dishes. This recipe yields 4, 1 piece servings. Slice your bread crosswise, to about 1/2 inch thick slices. Place the bread slices on a baking sheet. Spread the butter (or olive oil) on one side of each piece of bread. Generously sprinkle garlic powder over the butter, or spread 1/4 of the chopped garlic on each slice of buttered bread. Sprinkle with Italian seasoning, or basil. Sprinkle generously with grated Parmesan Cheese. Position oven rack at least 3 -4 inches below the top heating element. Remove, arrange on a serving platter, and serve it hot.